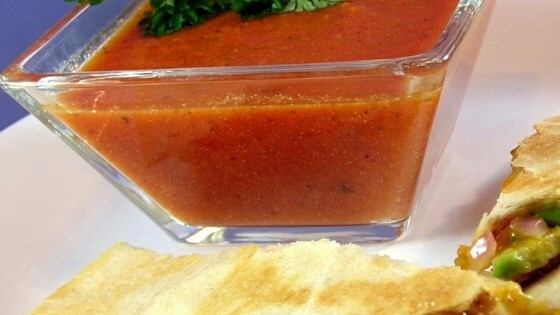 "This is a very simple, creamy and yummy soup, I do believe all will love it!" Heat oil in a large Dutch oven over medium-high heat. Saute onion and garlic until onion is tender. Add carrot and celery; cook 7 to 9 minutes until tender, stirring frequently. Stir in tomatoes, broth, Worcestershire sauce, salt, thyme, pepper and hot pepper sauce. Reduce heat to low. Cover and simmer 20 minutes, stirring frequently. too much onion that is all I could taste! Made this many times, but used a red onion this time, and my wife says this is the best! Thanks Corwynn for yet another great recipe! This recipe is out of this world. Guests love this special "scratch" dish!! Excellent recipe. I also added some crushed red pepper(I used to do this with the canned stuff). Easy and tasty, my favorite things. Great recipe! I added a bit of soy milk for a creamy texture (cream probably works well, too). I also added 1/2 tsp. each of cardamom and garam masala and a pinch of sugar. Everyone loved it!